Shangri-la Marina is a premier luxury residential community. There are 5 towers at Shangrila. Our condominium is located 'front row' lies directly on the beach in tower one, with unobstructed views (the most sought after). There is a close proximity to the marina and yacht harbor, next door to the Marriott Casa Magna, 5 minute drive from the airport, a championship golf course across the street, access to water activities are readily available, and the steps to the beach enhance the desirability of those fortunate enough to make this vacation opportunity a reality. From the moment you enter this remarkable condominium on the 11th floor with 3500 square feet, it is apparent that every detail was carefully planned, professionally designed with attention to detail and an amazing eye for style. Step off the private elevator directly into the condominium to an inviting foyer with faux painting and designer medallion flooring. You will be immediately overwhelmed by the panoramic view of the Bay of Banderas, city lights and Sierra Madre Mountains. The welcoming gourmet kitchen has state of the art stainless steel appliances, granite counter tops, tumbled marble back splash, oversized work island and breakfast bar and a custom water filtration system. The kitchen has a large window overlooking a spectacular view of the sun rise, cruise ships entering port, the pool, ocean and beach below. Just beyond the kitchen is the elegant dining room with a built-in bar and a hand-carved inlaid marble table which will seat up to twelve . The generous living area features a custom built-in entertainment center with a 56 inch flat screen TV, iPod station, DVD and CD player. Complimentary wireless internet. The balcony is a paradise of tranquility and relaxation with unobstructed views of the bay and beach. Enjoy the sunset while resting on a lounge chair gazing at cruise ships leaving port or have a special meal on the outdoor dining table, which can accommodate ten. The hallway is appointed with exotic works of art from local artists to enhance your Vallarta experience. Enter the exquisite master suite through double doors and appreciate the spaciousness of the room with a 42 inch flat screen TV, as well as the magnificent ocean view from the sliding doors. The master bathroom has a custom marble shower, dual basin sink, an oversized jetted whirlpool tub which looks over the bay, and walk in closet with a safe. Master Suite #2 has a queen sized bed, 42 inch flat screen TV, walk in closet, private bath and balcony with views of the pool and the beach below. Bedroom #3 has 2 full sized beds, 36 inch flat screen TV, a walk in closet, private bathroom and balcony over looking the view of the mountains. Bedroom #4 has 2 twin sized beds and a private bathroom. The laundry room is conveniently located to the rear of the condominium with a back door leading to a service elevator. The Marina of Puerto Vallarta offers 320 days of sunshine. There are fireworks every night in the bay with spectacular views from your balcony. The Bay of Banderas is a permanent residence for over 300 bottle nose dolphins year round. n season, you will find whale watching, a popular activity in the last two weeks of January and the first two weeks of February. September is the active month for the birth of the sea turtles on our beach. The Marina and Yacht Harbor is home to over four hundred slips, thirty restaurants, boutiques, cafes, day spas, salons, art galleries, fishing and water activities and a championship golf course all located across the street from Shangri-la. Visit the historic downtown with the famous malecon, street fairs and performers, endless shopping and night clubs or visit the nearby towns. Reserve a fishing excursion or jungle tours available through our personal Concierge. Puerto Vallarta has one thousand restaurants which attract the best chefs in all of Mexico. Three of the top ten restaurants are located in the Marina. Central air in every room, 5 minutes from airport, ceiling fans in all rooms, private elevator opens into foyer, floor to ceiling sliding glass doors, 2 lighted tennis courts, poolside restaurant and bar, hair dryers in each bathroom, maid service once a week. We travelled with our family and friends to Puerto Vallarta and really enjoyed our stay in this condo. 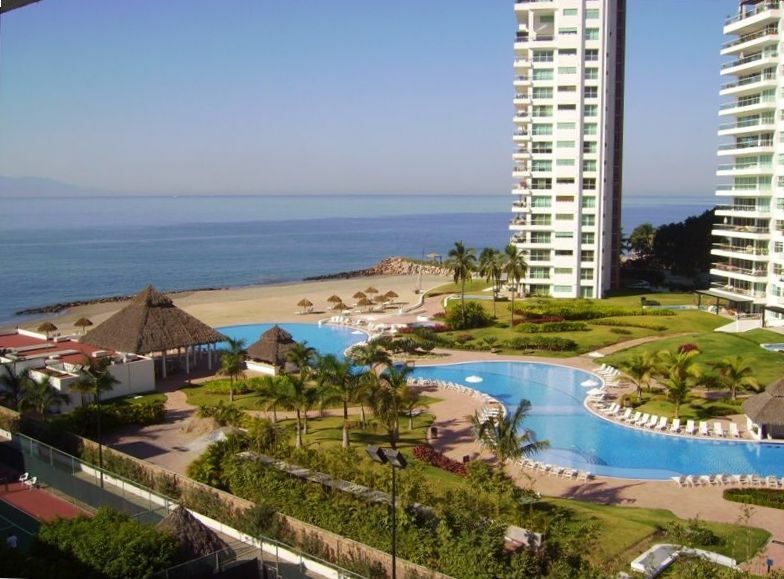 We have stayed in Marina Vallarta many times before and Shangri-La 3 times and we are never disappointed by the area and the condos. We love all the shops and restaurants the marina offers. This was our first stay in Bobbi’s condo and we couldn’t have been happier. The view walking onto the deck is jaw dropping- it feels like you’re walking over the ocean. She was very nice and helpful and did everything to make sure we enjoyed our stay. Her condo felt like a home and we are grateful they let us use their home for our stay. Welcome to Paradise at Shangri-La! This fabulous oceanfront condo is located on the 11th floor of Torres Uno - closest of five towers to the beach. The grounds and large pool area (so nice to be able to order food and beverages right from our lounge chairs!) are meticulously cared for. Bobbie and Hadi's condo is beautiful! They have decorated with many interesting and colorful art pieces. My family and I so enjoyed our time swimming, walking across the street to the Marina area, an easy taxi ride to the Malecon, not to mention the close proximity to the airport. Bobbie was so helpful with our questions/concerns and provided many recommendations for dinner, shopping, excursions. Rolando met us when we arrived and gave us a "tour". The staff couldn't have been friendlier (especially Miguel) and we felt very safe at this spot. We walked the beach several times and felt so fortunate that we were at Shangri-La and not at the crowded and noisy resorts. This truly was a dream vacation. Thank you, Bobbie and Hadi, for treating us like royalty. We can't wait to return to this charming city! Thank you Deborah, thank you for your glowing testimonial. We are pleased to offer our home to you and your family and appreciate you acknowledging our attention to detail while creating an abundance of comfort. We have been blessed to own a fabulous home in tower one with the unobstructed views. We are very grateful for our manager and Shangri-la staff. I will pass on the compliments to them. We hope you select us next time you vacation in Puerto Vallarta. Spent a wonderful 9 days with Lori & John in your beautiful condo. Excellent accommodation, stunning views... very relaxing!!! The staff were very knowledgeable and helpful. When not touring the local sights, we enjoyed many hours relaxing by and in the crystal clear pool. Hope we can repeat this for another memorable vacation. Thank you so much for the opportunity to stay at the Shangri-La. We really enjoy ourselves and the family time at your home. The views are amazing the minute you step off the private elevator. It was well decorated and clean in everyway. We would love to stay there again if you are willing. There is nothing to worry about when dealing with this owner. Honest, thoughtful, through, and caring very much about your welfare while you are staying here. Thanks again Bobby and let us know if we can stay there again for a couple of weeks. Truly Spectacular. This is indeed Shangri-La!! Bobbie and Hadi's home is luxuriously decorated with all state of the art conveniences. The view (certainly, one of the best in all of Vallarta) of the Bay and the mountains is absolutely breathtaking. Watching the cruise ships arrival directly from your balcony an absolute bonus. The grounds are beautifully manicured with a very convenient restaurant/bar at the large, shaped infinity pool. The marina ( a 5 minute walk directly across the street) with its fabulous yachts and fantastic views of the mountains has many boutiques and great bars/restaurants. Buses and taxis to anywhere in the Vallarta area are readily available. Most importantly, Bobbie and Hadi are the sweetest people and the concierge, Miguel, ever helpful. This was truly, a PERFECT VACATION!!! Thank you for letting us rent your amazing home. Thank you for letting us rent your amazing home. My family and I enjoyed our stay. Your home exceeded our highest expectations and you are correct that the photos do not do it justice. Our family was spoiled from the luxury, spacious pool, pool bar/restaurant, gym and the breathtaking views from your home. The location was perfect for us as well. 5 minutes walk to the Marina and 10 minutes taxi ride to Downtown, Malecon. We did lots of activities including fishing, ATV, horse back riding and zip-lining. We absolutely enjoyed our vacation and staying at you spectacular home MADE IT PERFECT!! Rolando and Luis were very pleasant and Salvador was great!!! Thank you for your call upon our arrival to make sure that everything was good. It was wonderful to know that should we need to get hold of you, you were only a phone call away... Our stay at Shangri La was wonderful and we felt very safe. We can't stop telling our friends about your property and our vacation. Thank you for your kind words. We have been blessed to own one of the most beautiful condos with the most amazing views and location in all of PV. We are very pleased to offer our home to wonderful families like yours who appreciate our attention to detail and desire to create a luxurious yet comfortable atmosphere. We do have an amazing manager and consierge! I will be sure to pass this on to them. Please know we will always try to accomodate you on your future trips.